Financial markets today look just how you would expect them to look on a hot sunny day in August. There’s not a lot going on. Take economic data, for example. We’re already three days into the trading week and the only reports of note so far have been JOLTs (which really isn’t really a market-moving report) and Consumer Credit. While the slowness of today feels normal, there was actually a time when things happened in August. A case in point? 2011. Seven years ago today, financial markets opened the week sharply lower. 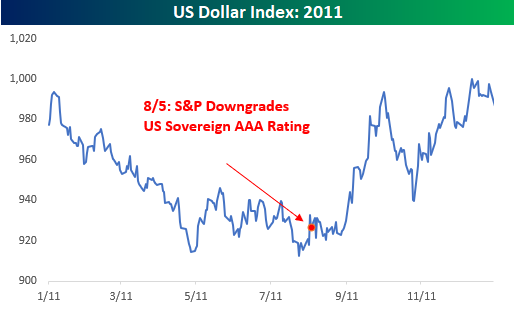 The culprit behind the weakness was Standard and Poor’s downgrade of the USA’s sovereign credit rating from AAA to AA, ending a run of seventy years with the highest rating. The rationale for the downgrade was the rating agency’s reduced confidence in the government’s ability to manage its finances. If you don’t recall, leading up to that downgrade, Washington was embroiled in a showdown over the debt ceiling. The GOP claimed that it wanted spending cuts to accompany any increase in the amount of debt the US was authorized to issue, while Democrats claimed Republicans were playing politics and wanted an increase in the debt ceiling with no strings attached (as prior increases had been confronted in years past). It came right down to the wire, but at the end of July 2011, Congress reached a deal two days before the US would have been forced to default on some of its obligations. While the issue was resolved, financial markets were in turmoil all throughout the final days of negotiations, leading up to the debt downgrade, as well as after. 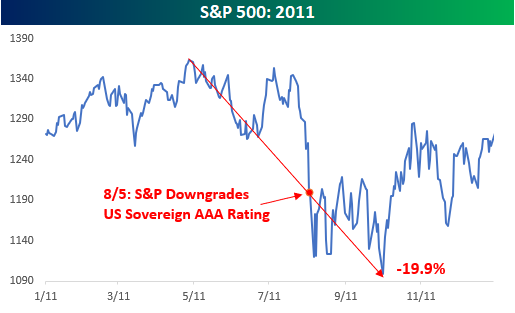 The downgrade actually came on the Friday before August 8th, when S&P issued a release after the close of trading on August 5th. It’s not only companies that wait until Fridays when everyone is out of the office to release bad news! Immediately after the downgrade, S&P received widespread criticism and was accused of playing politics. Who were they to suddenly question the ability of the US government to repay its debts when they had missed the biggest credit bubble in history just three years earlier? Critics argued that while Standard and Poor’s had no issue slapping AAA ratings on subprime CDOs during the housing bubble, now they questioned the ability of the US, which has a printing press at its disposal, to make good on its debts! Within a month of the downgrade, the President of S&P stepped down after the Treasury and Obama Administration questioned the methodology S&P used in their assumptions. Monday, August 8th was plain and simple a bad day for US equities right from the start. At the open, the S&P 500 was already down 1.6%. Two minutes after the open, it was already down over 2%. By 10:30, it was down 3%. By noon, we were down close to 4% and still declining. 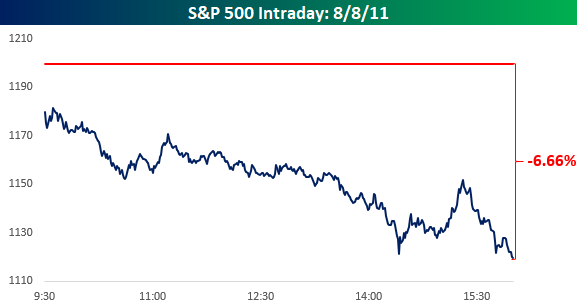 Shortly after 2 PM, bulls tried to make a stand, but it didn’t last, and at 4 PM, the S&P 500 finished at its lows of the day with an ominous decline of 6.66%. How’s that for a start to the week. All around financial markets, there were big moves. Strange enough as it sounds, treasuries actually rallied that day with the 10-year yield falling 24 basis points to 2.32%. From there, it continued to decline right through September as it dropped below 2%. Believe it or not, the yield on the 10-year was actually higher in the first half of 2011 than it is now, and at one point was above 3.5%. The dollar also caught a bid in the days after the downgrade and by the end of September was near its highs of the year. Movements like we saw in treasuries and the dollar after the US debt downgrade prove the ever important fact that when it comes to financial markets, nothing is certain except the past. Since the close on 8/8/11, the S&P 500 is up 138%, while the average return of stocks that are currently in the index since then is a gain of over 200%! During that time, five stocks are up over 1,000%, and none of them are Netflix (it’s ‘only’ up 970%)! A total of 37 stocks are up over 500%, while two-thirds of the stocks in the index have at least doubled. At the same time, just 27 stocks in the index are down. Think about it this way; after the close of trading on 8/8/11, if you picked any stock at random, you would have been more likely to pick a five-bagger (500%+ gain) than a stock that went down. Even more amazing is that you would have been ten times more likely to pick a stock that would double as opposed to one which would have lost money. As bad as the market felt that day, in retrospect, it was a great buying opportunity. The big question investors have to answer for themselves today is that seven years from now if we look back on today, will we be able to say the same thing? This week is options expiration week and mid-August is usually better performing than the beginning and the end of the month. This strength is punctuated with a three-day string of bullish days running from today until Friday August 17. A bullish day is defined as a trading day in which the S&P 500 has risen greater than or equal to 60% of the time over the past 21 years. Unfortunately, this bullish cluster has not always resulted in full-week gains during option expiration nor does this daily bullish streak guarantee market gains on each day. DJIA and S&P 500 have declined on August option expiration day seven times in the last eight years and have suffered full-week losses in six of the last eight August expiration weeks. 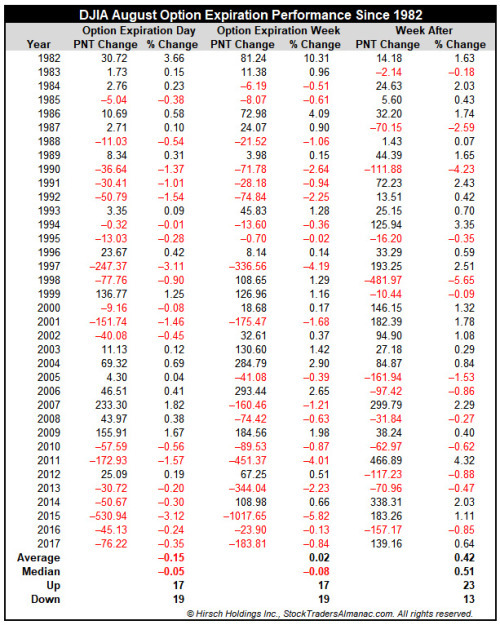 Since 1950, September is the worst performing month of the year for DJIA, S&P 500, NASDAQ (since 1971), Russell 1000 and Russell 2000 (since 1979). September was creamed four years straight from 1999-2002 after four solid years from 1995-1998 during the dot.com bubble madness. 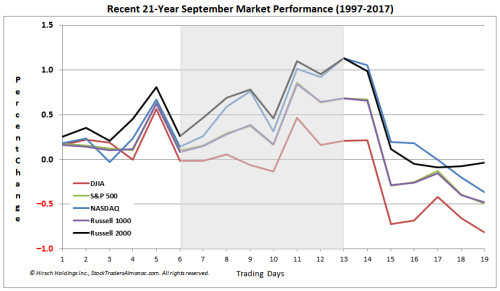 Although September’s overall rank improves modestly in midterm years going back to 1950, average losses widen for DJIA (–1.0%), NASDAQ (–0.8%), Russell 1000 (–1.1%) and Russell 2000 (–0.6%). S&P 500’s average September loss improves slightly from –0.5% to –0.4% in midterm years. Although September 2002 does influence the average declines, the fact remains DJIA has declined in 11 of the last 17 midterm-year Septembers. The month has opened strong in 14 of the last 23 years (a fading trend as S&P 500 has been down five of the last seven first trading days), but as tans begin to fade and the new school year commences, fund managers tend to clean house as the end of the third quarter approaches, causing some nasty selloffs near month-end over the years. Recent substantial declines occurred following the terrorist attacks in 2001 (DJIA: –11.1%), 2002 (DJIA –12.4%), the collapse of Lehman Brothers in 2008 (DJIA: –6.0%) and U.S. debt ceiling debacle in 2011 (DJIA –6.0%). In May and June, speculative traders of Treasury futures were taking large short positions, believing that rates would move higher and the short positions would reap a profit. Since then, that net short position has increased by almost 50%, building to the largest short position—by a wide margin—in the history of the Treasury futures market. When speculative traders initiate short positions, they hope that rates rise, leading to a potential profit (if the trader buys a futures contract in order to close out their short position and realize that profit). However, if rates move against these traders and fall from their current levels, the 10-year Treasury could be in for a “short squeeze,” when traders on the wrong side of a trade get squeezed into closing out their positions to limit losses. Traders in these contracts could see losses and buy Treasury futures contracts in an attempt to limit the damage, which would push prices up, weigh on yields and could lead to more traders buying futures to close out their positions. As shown in the LPL Chart of the Day, massive short positions have generally led to declines in rates, and large long positions have generally led to increases in rates. If a catalyst pushes yields meaningfully below 2.8%, the bottom of the range for the 10-year Treasury yield over the last six months, a short squeeze could push yields lower and fuel the snowball effect of a short squeeze. We estimate yields could fall 20 to 40 basis points (0.2% to 0.4%) as Treasury futures revert back to neutral positioning from current levels, based on historical rate moves during similar changes in positioning. 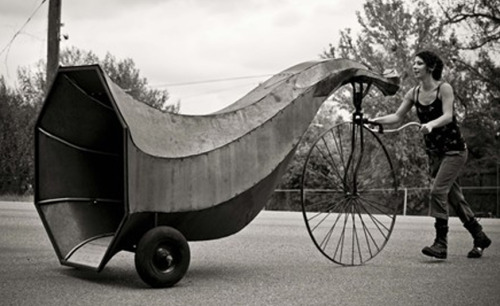 Futures and forward trading is speculative, includes a high degree of risk, and is not be suitable for all investors. Since 1950, no month sports a lower average return than September, with the S&P 500 Index down 0.47% on average. June and August are the only other months that are generally in the negative, while November and December tend to be the strongest months of the year. 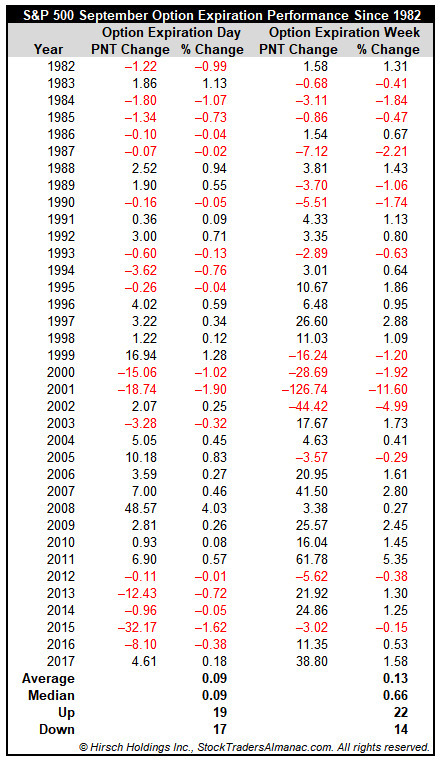 In the past 20 years, September has been the second-worst month, with only August fairing worse. More recently, over the past 10 years, it’s still down on average but comes in at the fifth-worst month. The worst September ever for the S&P 500 was a 30% drop in 1931. In fact, no other month has had more 10% drops than September, at seven. Interestingly, January is the only month that has never been down 10% or more. Since 1950, if the S&P 500 starts September above its 200-day moving average (like 2018 will), it tends to do much better, as it is up 0.4% on average versus down 2.7% if it starts the month below the 200-day moving average. Last, as we shared last week, when the S&P 500 is up in the five months heading into September (like 2018), the month has historically done quite well, up 2.3% on average and higher four out of five times since 1950. Although August is the worst month of the year for the market since 1987 (recent 31-year period), September is the worst month going back to 1950 for DJIA and S&P 500. 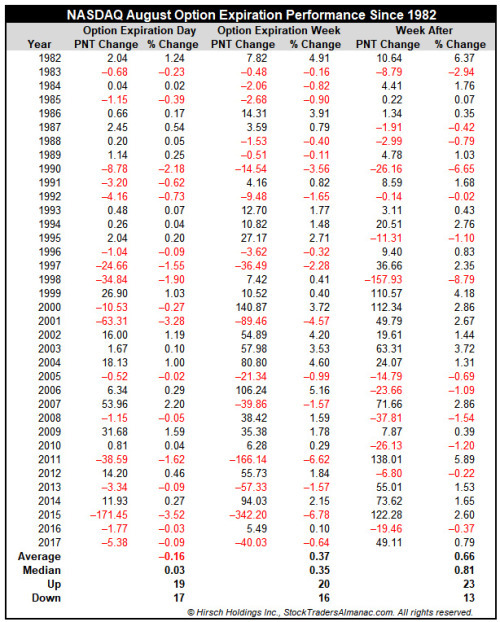 It is also the worst month for NASDAQ since 1971 and the worst for Russell 1000 and 2000 since 1979. Looking at the full month of September one day at a time, just before mid-month has offered the bulls the best opportunity with the chart exhibiting strength from around the close of the sixth trading day to the close of the thirteenth trading day. The tenth and twelfth trading days briefly interrupt the trend. After this stretch, the final third of the month is generally weak with all five indexes quickly surrendering earlier month gains. We laughed when we saw the headline below linked on the popular Drudge Report website this morning. “Apple becomes most shorted company ahead of iPhone launch…” Here’s a link to the story posted on Telegraph.co.uk. For those reading this headline that aren’t familiar with the inner-workings of short selling, the assumption might be that investors are turning extremely negative on Apple (AAPL). This assumption would be completely wrong, however. Yes, when it comes to the $ amount of Apple (AAPL) shares that are sold short, the stock is right at the top of the list at $9.2 billion. (Note that as of the close yesterday, Amazon.com (AMZN) actually had Apple beat in this regards.) But measuring short interest by $ amount is nonsensical because it doesn’t take a company’s overall market cap into account. 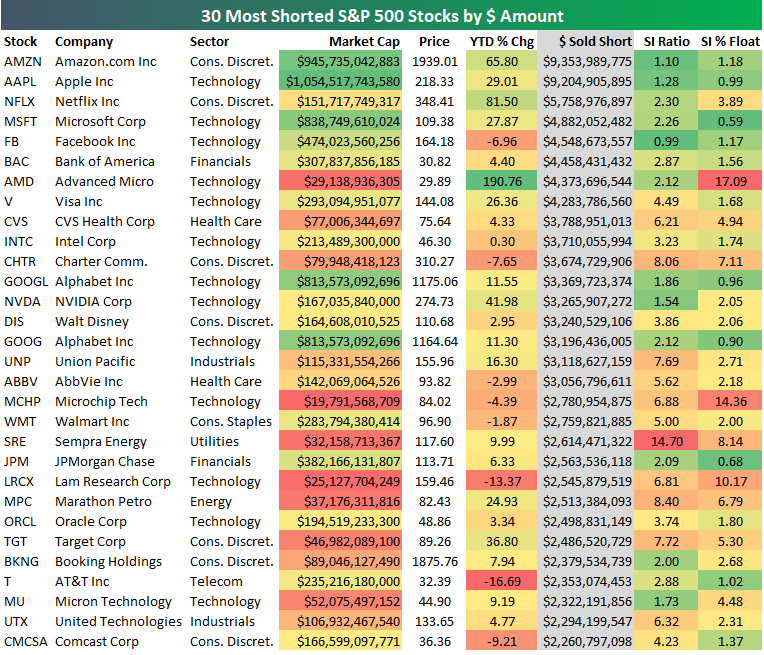 Below is a list of the 30 S&P 500 stocks with the highest dollar amount of shares sold short. For each stock, we also include its market cap, its YTD % change, its short interest ratio, and its short interest as a percentage of float. Short interest ratios and short interest as a percentage of float are the indicators that investors use to measure how true short interest levels. The short interest ratio is the number of shares sold short divided by the stock’s average daily volume. It’s also known as “days to cover” because the number tells you how many trading days it would take for short-sellers to cover all of their shares (based on the stock’s average daily volume). Short interest as a percentage of float tells you the percentage of a stock’s tradeable share count that are sold short, and this is the reading we use most often when measuring how bearish investors are on a name. As you’ll see below, most of the names on the list are only there because of their massive market caps. 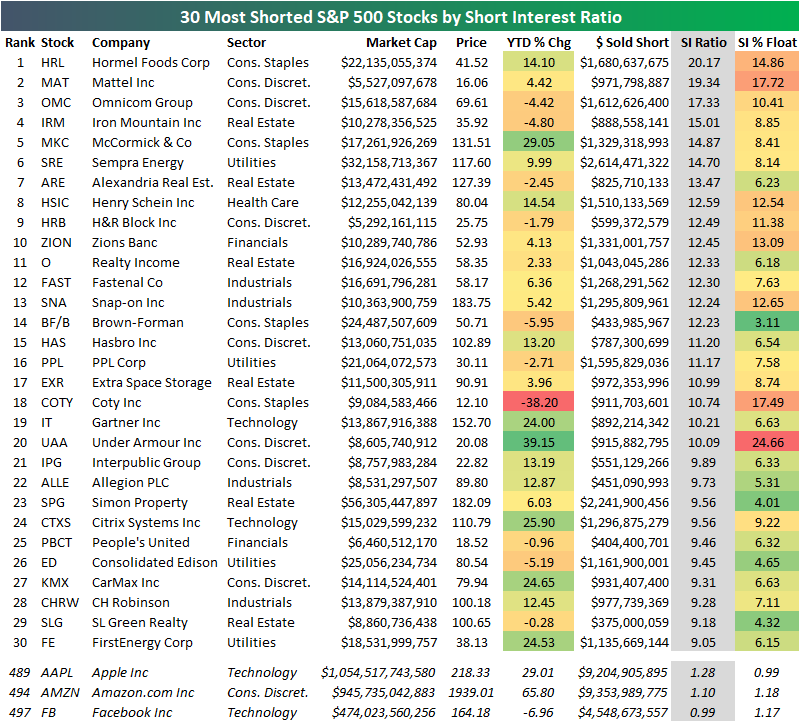 Stocks like Apple and Amazon indeed have a high dollar amount of shares sold short, but their short interest ratios and short interest as a percentage of float are right around 1. That’s actually an extremely low number for these two measures. 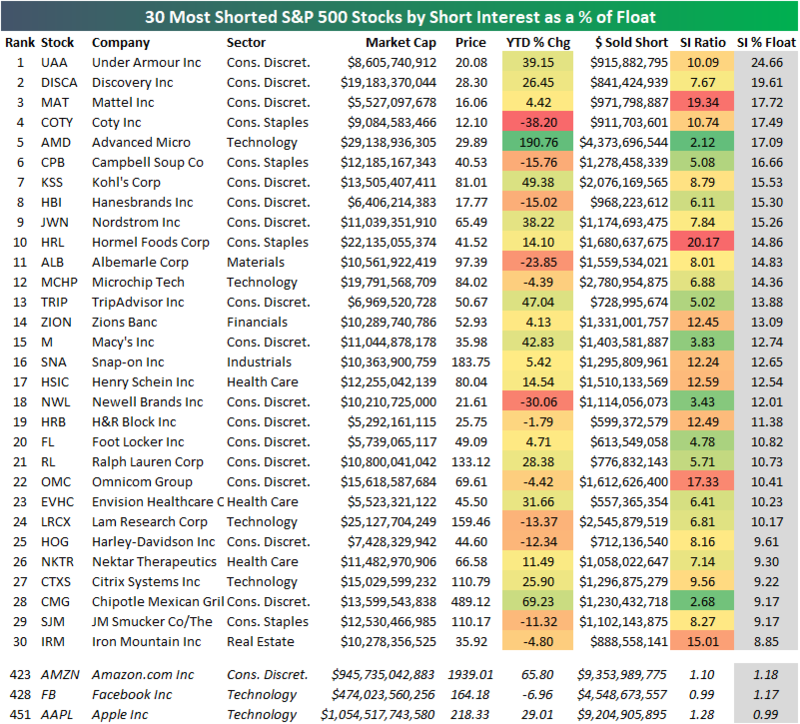 Below we highlight the actual list of the most shorted stocks in the S&P 500 using short interest as a percentage of float. As shown, Under Armour (UAA) tops the list with 24.66% of its float sold short, followed by Discovery (DISCA), Mattel (MAT), Coty (COTY), and Advanced Micro (AMD). 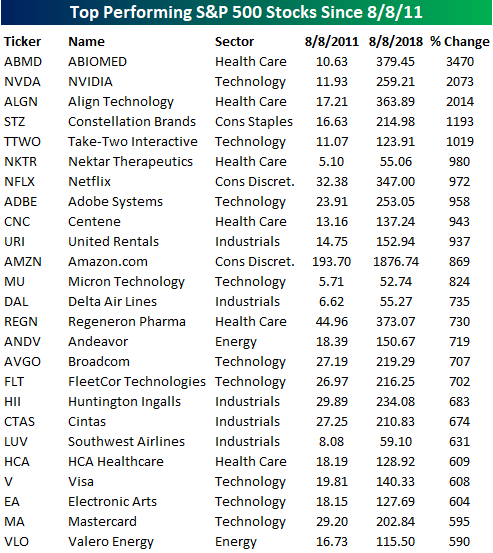 At the bottom of the table, we show that stocks like Apple (AAPL), Amazon.com (AMZN), and Facebook (FB) are actually some of the least shorted stocks in the S&P 500. Apple (AAPL) currently ranks as the 451st most shorted stock in the S&P 500 — hardly “the most shorted company” as the Drudge headline suggests. When it comes to short interest ratios (days to cover), Apple (and AMZN, and FB) rank even lower. Apple is the 489th most shorted stock based on short interest ratio, while AMZN ranks 494th and FB ranks 497th. Based on short interest ratios, Hormel Foods (HRM) is at the top of the list with a reading of 20.17, followed by Mattel (MAT), Omnicom Group (OMC), and Iron Mountain (IRM). September’s option expiration week is up 61.1% of the time for S&P 500 and NASDAQ since 1982. DJIA has a slightly weaker track record with gains 55.6% of the time. However, the week has suffered several sizable losses. The worst loss followed the September 11 terrorist attacks in 2001. 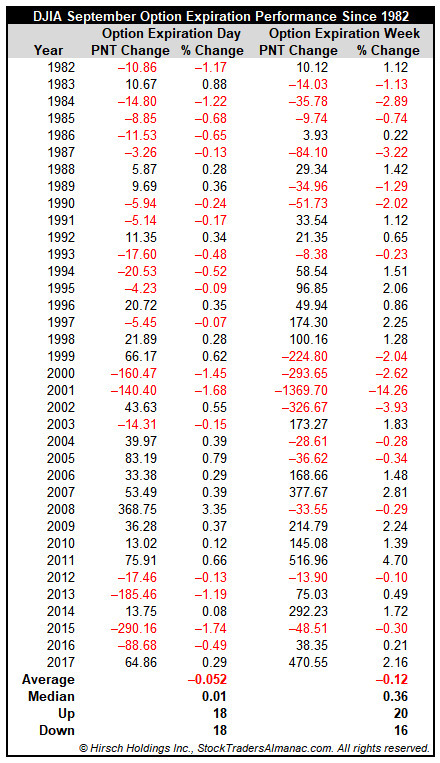 In the last fifteen years, NASDAQ has the best record during September’s option expiration week, up thirteen times. 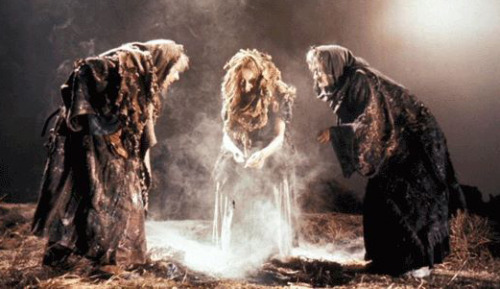 Triple-Witching Friday had been firm with all three indices advancing every year 2004 to 2011, but S&P 500 has been down five of the last six since and DJIA and NASDAQ four of six. On Wednesday another Fed meeting will come to an end and another statement regarding monetary policy will we released. As of today, CME Group’s FedWatch Tool is showing a 93.8% chance the Fed will raise rates to a new range of 2.00 to 2.25%. There is also a small 6.2% chance that the Fed raises the range by 0.50%. If the Fed broke from recent tradition and hiked by 0.50%, the market would likely not respond well to the sudden change. Historically down announcement days have been better buying opportunities than positive announcement days. 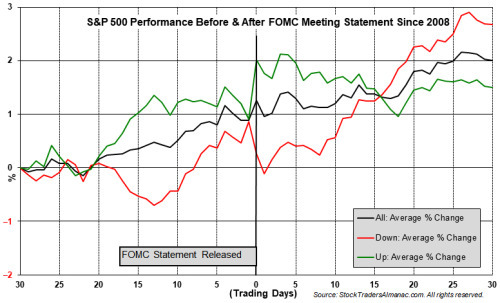 In the chart below the 30 trading days before and after the last 84 Fed meetings (back to March 2008) are graphed. There are three lines, “All”, “Up” and “Down.” Up means the S&P 500 finished announcement day with a gain, down it finished with a loss. Note how past down announcement days have, on average, enjoyed the best gains over the next 30 trading days. Of the last 84 announcement days, the S&P 500 finished the day positive 48 times. Of these 48 positive days S&P 500 was down 28 times (58.3%) the next day. Of the 36 down announcement days, the following day was down 21 times (58.3%). All 84 announcement days have averaged 0.39% S&P 500 gains while the day after has been a net loser with S&P 500 declining 0.31% on average. Since the December 13, 2017 meeting, S&P 500 has declined on five of the last six announcement days with an average loss of 0.23%. 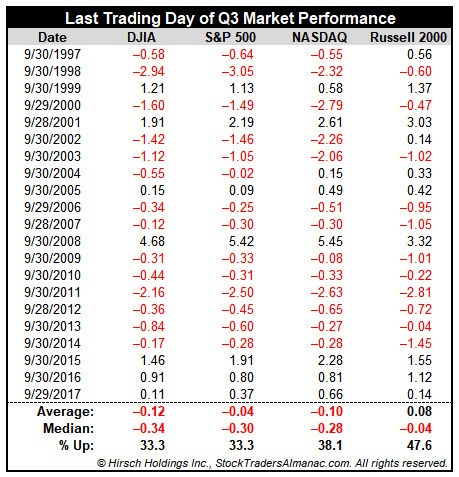 Over the last 21-year period the last trading day of the third quarter has been bearish. DJIA and S&P 500 have advanced just 33.3% of the time with average losses of 0.12% and 0.04% respectively. NASDAQ and Russell 2000 have performed slightly better, but still have declined more frequently than advanced. The best year for the last trading day of the quarter was in 2008 while 1998 and 2011 are essentially tied for worst. From 2006 through 2014 (nine years) the last trading day of the third quarter was only up once. Performance has been improving lately with all four indexes posting gains over the last three years. it is said that panic spreads way faster than trend building so if someone catches bearish move than may be he can generate big profits in less time. 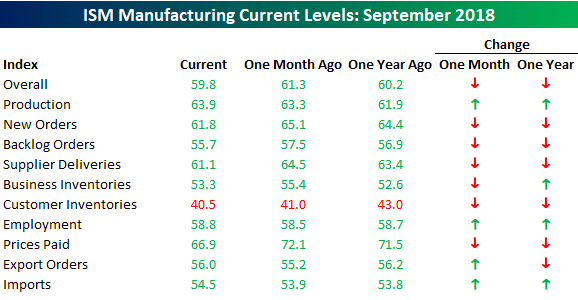 After surging to a multi-year high in August, the ISM Manufacturing index pulled back slightly more than expected in September, falling from 61.3 down to 59.8 versus expectations for a drop to 60.0. As shown in the chart, though, activity is still at extremely robust levels. 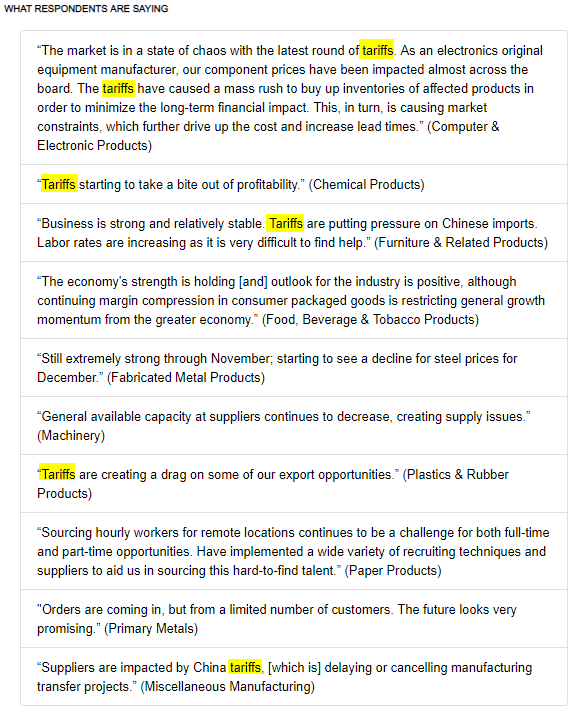 In terms of the commentary of this month’s report, it was generally positive, but that strength is being clouded by the issue of tariffs, which is showing up in a number of sectors like Computer and Electronic Products, Chemicals, Furniture, and Plastics. As far as the breakdown of this month’s report is concerned, breadth was relatively weak. On a m/m basis, just four categories improved while six declined. Production was one bright spot, as were Export and Import Orders, which is a bit surprising given the recent barriers to trade. The only other category to show a m/m increase was Employment. On the downside, the most notable decline was Prices Paid. That index dropped from 72.1 down to 66.9 which is the lowest monthly reading of the year and largest m/m decline since last June. Here again, one would expect the increasingly tense trade environment to be having upward rather than downward pressure on prices. 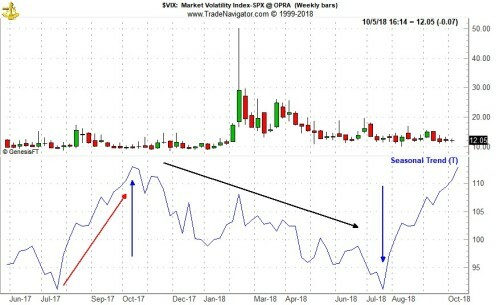 Historically speaking, the CBOE Volatility Index (VIX) tends to reach its seasonal high in the month of October. 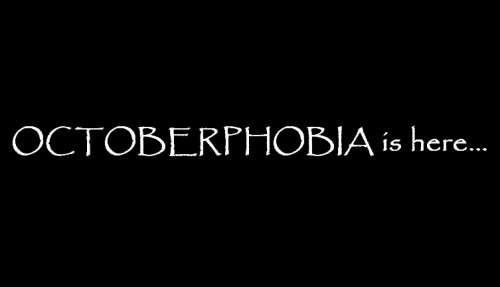 This may be due to the fact that the two worst performing months of the year, August and September (by average performance) precede it. October also has the honor of slaying twelve, post-WWII bear markets. A bear market’s low is frequently accompanied by high levels of fear and market volatility. VIX’s seasonal pattern can be seen in the following chart. October’s peak and July’s low are indicated by blue arrows. October’s volatility peak is also visible when actual daily percent changes are analyzed. 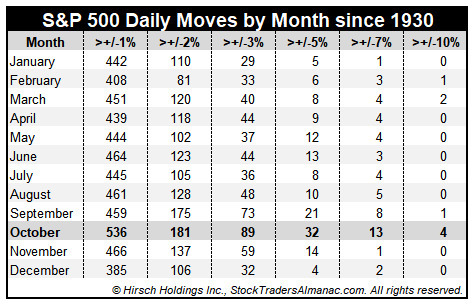 October has hosted the most daily moves in excess of 1%, 2%, 3%, 5%, 7% and even 10% since 1930. Do not fret over the nine times S&P 500 has moved more than 10% in a single day. 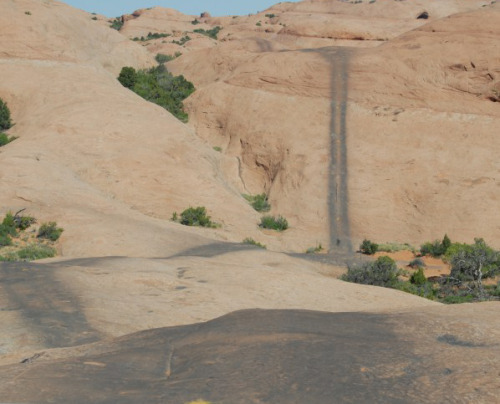 Six of the nine occurrences were way back in the 1930’s. Only three have occurred more recently and out of those, two were actually positive days (10/13/2008 +11.58% and 10/28/2008 +10.79%). Actually only two of the nine days with moves in excess of 10% were negative days: 3/18/1935 –10.06% and 10/19/1987 –20.47%. Keep an eye on BND, or any other quick-n-dirty proxy for bond prices. So far this morning, yesterday's bond price collapse is continuing and yields are taking off. 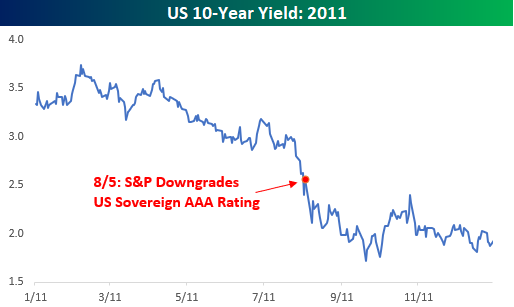 This was the telltale sign that rattled the markets last winter and led to the correction in equities. 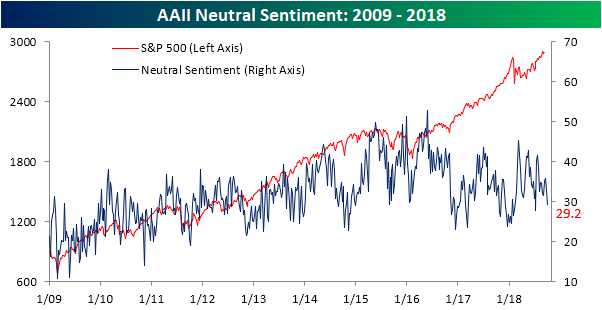 With the Dow suddenly hitting record highs on what seems like a daily basis, you would expect to see individual investor sentiment improve, and that’s exactly what we saw this week. 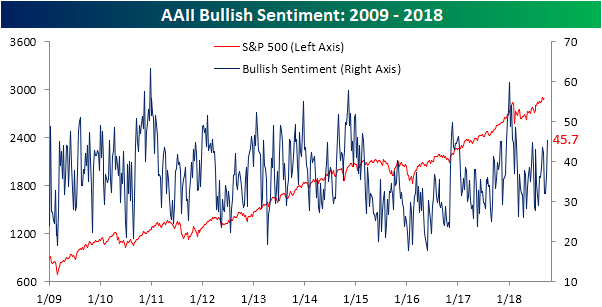 According to the weekly sentiment survey from AAII, bullish sentiment surged 9.4 percentage points to 45.66% from last week’s reading of 36.22%. That move represents the largest one week increase since early July and the highest weekly reading since mid-February. While we’re not quite at the 50% reading yet, we would note that the last time optimism in this survey neared the 50% level was in late December. That wasn’t the exact top of the market right before the correction, but it was close to it. 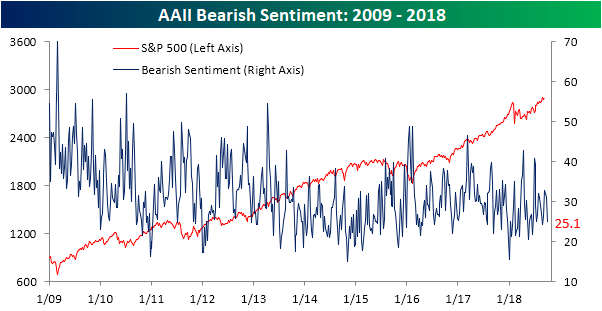 While bullish sentiment starts to rise, bearish sentiment is back down in the mid-20 percent range, which is a level it has seen repeatedly throughout the year. So if all the new bulls didn’t come out of the bearish camp, where did they come from? As shown in the chart below, the pool of undecideds continues to shrink as it fell from just under 33% last week to 29.22% this week. That’s the lowest level since mid-July. 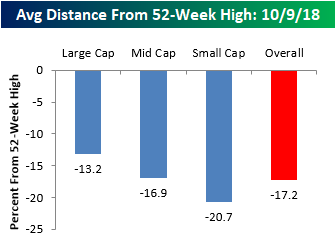 Most people watching have noticed that the recent weakness in equities has been especially tough on the small-cap space, and another illustration of that trend is to look at the distance that stocks are currently trading from their 52-week highs. Within the large-cap S&P 500, the average stock is currently 13.2% below its 52-week high. Moving down the market cap spectrum, though, the numbers get progressively worse. In the S&P 400 mid-cap space, the average spread is 16.9%, while members of the S&P 600 Small Cap index are down an average of 20.7%. Using the standard bear market definition of a 20% decline from a high, the average small-cap stock is in a bear market! Looking at the spreads between current prices and 52-week highs, stocks in the Consumer Discretionary sector are further from their highs than any other sector (-22.9%), but Technology isn’t far behind at 21.4%. For two sectors that were market leaders, Tech and Discretionary have certainly seen a good deal of profit-taking lately. Outside of these two, other sectors where the ‘average’ stock has seen a pretty sizable pullback from its 52-week high include Materials (-19.8%), Health Care (-17.9%), and Consumer Staples (-16.6%). 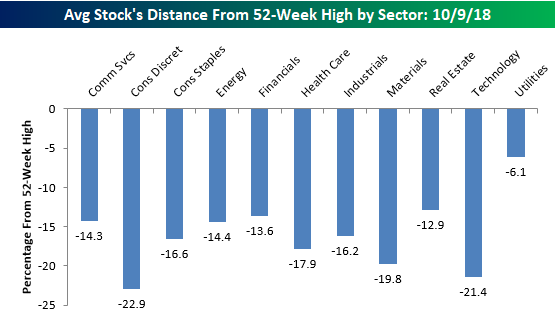 On the other end of the spectrum, Utilities (-6.1%) is the only sector where stocks are currently down by an average of less than 10% from their 52-week highs. lt’s not exactly news that global markets have been significantly weaker than the US this year. Almost every single international ETF is down year to date; a few of which are down by double digit percentages. Only two have managed to edge out slight gains YTD. The Global 100 (IOO) has seen gains of 4.1% and the MSCI All Country World Index (ACWI) is up 1.03%. Unlike other ETFs in the Regions category of our Trend Analyzer, these two have US exposure that has helped them stay afloat. In the past week though, not even this has been a saving grace; just about every ETF is down well over 1%. Emerging market ETFs are especially feeling the pain as they have each dropped over 4%. The MSCI All Country Asia excluding Japan (AAXJ) has had the worst performance of all. It has fallen 6.06% in the past 5 days! 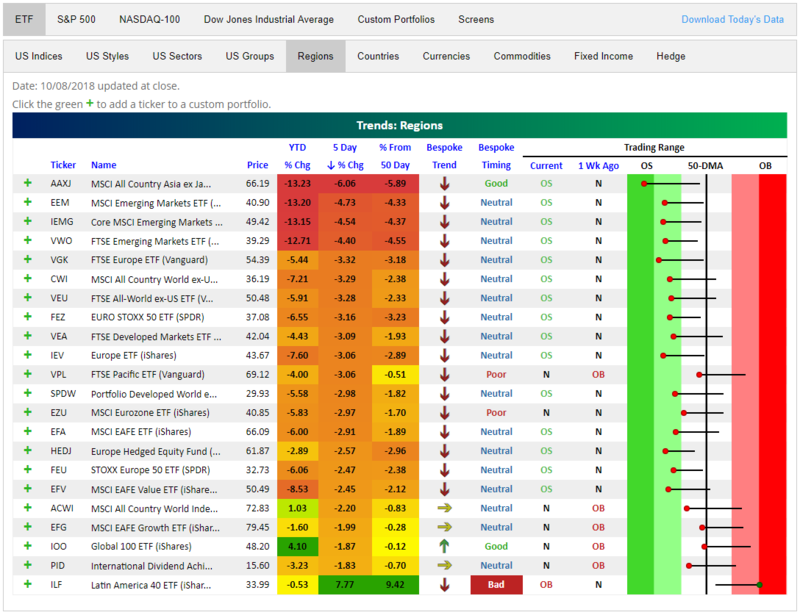 Looking at the long tails in the Trading Range section of the Trend Analyzer, you can see the large movements below the 50-DMA for most of the ETFs included in this group. This has pushed many deep into oversold territory. All the negativity aside, the Latin America 40 (ILF) has been gaining ground recently with a huge jump up yesterday thanks to Brazilian first round election results. Currently, it is up 7.77% since this time last week. While good, it may be getting overextended. It is the only overbought member of this group sitting 9.42% above its 50-DMA and our Trend Analyzer has given it a bad timing rating based on its extreme overbought reading. My bearish analysis which may be completely wrong! That vertical red line is when market volatility popped. You can see the trading range expanded pretty dramatically. Then the QQQ settled into a new lower trading range. I picked out the highs and lows in the charts to establish what I feel is the latest resistance and support areas and so if the QQQ can push through 181.82 my bearish feelings will be rebuked. I've been following QID as it gives a way to short the QQQ without actually shorting it (by buying inverse stock) and without using put options on the QQQ. In the QID, 37.16 would be what I would want to hold as a new support. As of right now, the QID is at 37.78 so it could easily blast through that number if the QQQ heads higher. Small business sentiment for the month of September was released earlier this morning, and while the headline index saw a modest decline (108.8 down to 107.9) and came in below consensus forecasts 108.3, the overall level is still extremely optimistic. One of the more interesting comments in the report was that “The economy is growing faster than our ability to support that growth without inflation or significant productivity gains.” It’s this line of reasoning which is exactly why the FOMC is so vigilant with respect to upward moves in prices. The table below summarizes the issues that small businesses currently cite as their biggest problems. Topping the list once again this month is Quality of Labor. While it could just be a one-month blip, it was a bit encouraging to see that that reading actually dropped from 25% in August to 22% this month. On the upside, the two components that saw the largest increases were Taxes (15 up to 17) and Competition (8 up to 10). 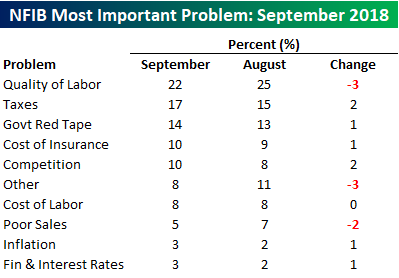 One other issue worth highlighting is the percentage of companies citing Poor Sales as their biggest problem. The percentage of companies citing this issue dropped from an already low level of 7% down to 5%. 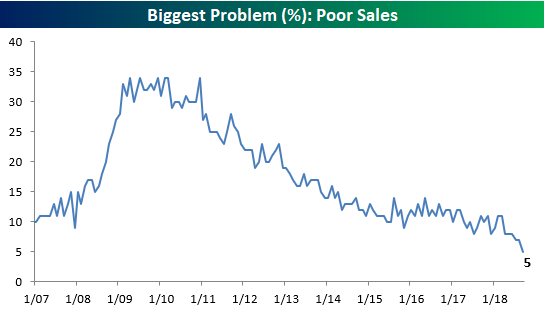 The last time the percentage was this low for the issue of Poor Sales was in January 1998, and it hasn’t been lower since the early 1980s. 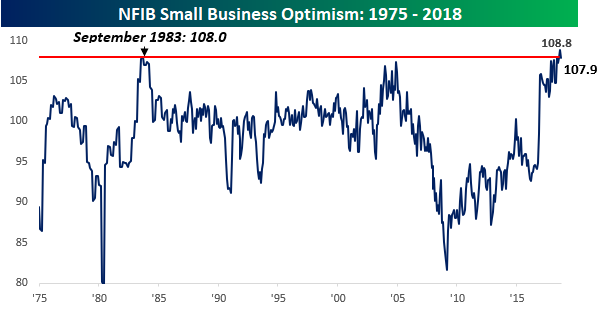 That’s a far cry from as recently as eight years ago when the percentage of small businesses citing it as their biggest problem was more than six times higher at 34%. Okay. Everybody relax. This is normal. This is a standard October seasonal selloff. There is a long and recent history of this sort of October market volatility. Today the market suffered its worst DJIA and S&P day since February 8, 2018 and the worst NASDAQ day by percent since June 24, 2016, the day after the Brexit vote. This is typical October behavior. And like we said last week this is to be expected at the beginning of October. The typical October chart is updated below with the current month-to-date performance as of today’s close overlaid. We may get some more downside this year than the average October, but with all the midterm machinations, Fed activity, frothy sentiment and rich valuations that is understandable. In all likelihood, the correction has a bit more to go, perhaps as deep as the correction in Q1 this year. Remember all the talk about how long we went without a 10% correction? Well, welcome to a little mean reversion. But as we conveyed back in February, remain calm and stick to the strategy. Aside from the political maneuverings and the trade war rhetoric three main reasons drove the market down this month: The Fed, seasonality and a technical breakdown today. The Fed, perhaps rightfully so, has continued to raise short term rates towards what it deems a “neutral” or normal level in good economic times, while at the same forecasting a slowdown in long-term economic growth rates. Then when 30-year Treasuries closed above 3.25% for the first time in 4 years, the market began to get spooked that the low rate punchbowl was really finally being taken away. We have held that the Fed is the biggest risk to the market. 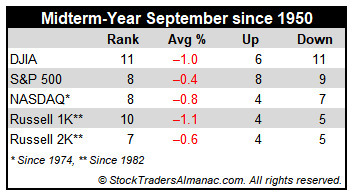 October volatile seasonality is well known and well-documented in the Stock Trader’s Almanac. Yes, Octobers are normally much better in midterm years, but less so after big gains in the first 9 months of the year as we had this year. 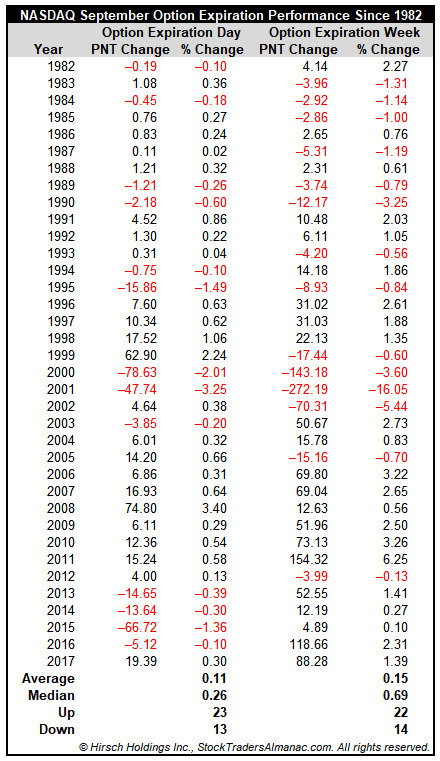 In the 17 midterm years since 1949 when the S&P 500 was up for the first 9 months (9 times) October gained an average of 1.6%, when it was down the first 9 months (8 times) S&P averaged gains of 5.2%. 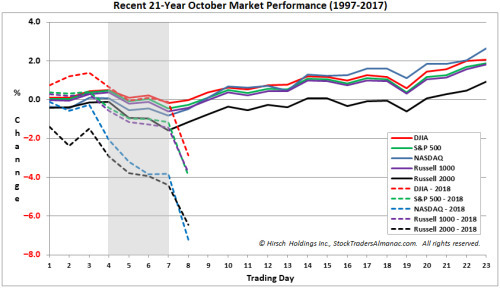 October is the best time to buy stocks (see page 90 in the 2018 Stock Trader’s Almanac) and late October is the best time to buy depressed stocks, especially techs and small caps (page 94). Our defensive and cautious stance is paying off so be patient and wait for our all-clear technical buy signal.